- in the second, a building block. Using them requires no other action. Take it off the bottle and use it. The caps will no longer go into the garbage neither will they make streets, beaches, etc. dirty. They will be bilt into daily life objects and toys. - they are made from the same recyclable raw materials as conventional caps. Springwise - "Clever Caps offer an environmentally friendly suluition to the production of bottle caps while also adding value to the objetcs to encorage consumers to reuse them." Fast Company - "These Adorable Bottle Caps Turn Into Lego-Like Toys. Why recycle when you can play with your trash?" 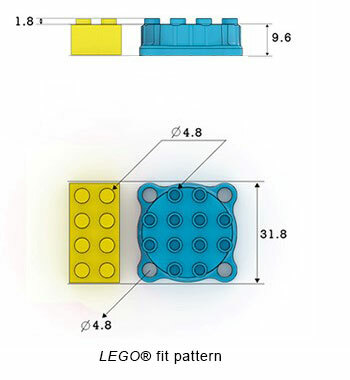 Design Taxi - "Instead of stacking up in landfills, the ridges above and below these caps enable them to add a new an interesting element to LEGO creations." Packaging of the Word - "A Brazilian company in the innovative packaging sector, Clever Pack deveolops bottle cap that establishes new paradigm in sustainability"
Are you Global? - "I like this kind of innovation because many people forget that also recycling wastes energy and pollutes the environment for transportation or the recycling process itself. So reusing is the much better way to contribute something to limit the detrimental effects on the environment." Impact Consulting - "These caps, created by Brazil-based innovative packaging devoloper Clever Pack, meet both a practical need and are given a second life as a collectable toy. What is the key lesson here? Rethinking Product Life Cycles Adds Value $"
DesingMuseum - "Clever Caps (Designs of the Year) - ' Recycling is a good option. Reusing is even better.' This product starts out life with two uses so when it's finished with as a bottle cap it becomes a toy building block"